I prefer to say, "God Bless"
Affliction may come, yet I rest in Thee. Check yours...which phrases do you seem to use the most? Why? If you find yourself using phrases like many of these, which have no bearing on a Christian's vocabulary, you might want to ask yourself, why? 1. Why would "luck" have anything to do with our lives or situations? 2. Isn't it by our own choices we cause certain things to happen? We make either good or bad decisions throughout our lifetime...the results follow. 3. If we choose not to allow God in our lives, then we usually use His name in ways that are in vain. We cannot call ourselves a follower of Jesus Christ and use His name as a curse word. ( Thou shalt not take the name of the LORD thy God in vain; for the LORD will not hold him guiltness that taketh his name in vain. Exodus 20:7) His name is one to be praised, honored and respectfully used. Yet, I hear people who claim to be "Christians" and maybe even go to church using His precious name flippantly. For them I say, "Shame on you!" You really don't know my Lord as you might think you do. Is there a time in your life when you admitted you were a sinner? Have you ever done things like lying, getting angry, stealing, telling bad jokes, cheating on your income tax, cheating on a school test, telling someone you love them just to get your way, drinking...I think you've got the picture. And I think we can all admit we are sinners. But what does the Bible says about being a sinner? We were made sinners because of our earthly father Adam and his disobedience in the Garden of Eden, when he took of the forbidden fruit. It wasn't the fruit that caused him to become a sinner, it was his "disobedience" to God in "eating" of it. He had a perfect relationship with God up until that point. "Having it his way or doing it his way caused separation and eternal death for all of us. This death the Bible refers to is a spiritual death. Separation from God for eternity. We don't want God telling us what to do. We don't want to follow any rules. We think we know what is best. We think we're good enough to make it into heaven. After all, we've never killed anyone, we've got more good points than bad. So the scale looks favorably towards us. God would never send someone to hell for using His name in vain. Besides, He knows I really didn't mean it. God is holy, God is righteous, God is just, and God is love. He loves us with an unconditional love. He knows we will sin, but He cannot let sin into His Heaven. So then, what's next? If He knows we are sinners and will continue to sin, then how do we get to heaven? God's provision: His only begotten Son, Jesus Christ. Romans 5:17 - For if by one man's offence death reigned by one; much more they which receive abundance of grace and of the gift righteousness shall reign in life by one, Jesus Christ. Romans 5:8,9,10 - But God commendeth his love towards us, in that, while we were yet sinners, Christ died for us. Much more then, being now justified by his blood, we shall be saved from wrath through him. For if, when we were enemies, we were reconciled to God by the death of his Son, much more, being reconciled, we shall be saved by his life. Ok, you say...so now what do I do? The Bible also says, there is only one mediator between God and men - Jesus Christ. 1 Timothy 2:5 (Everyone else is ruled out in bringing man and God together) He is the only way, because He laid down his sinless life and shed his blood for us. You see...Jesus paid it all! Call on the only One who can save you. The only One who can set you free from the burden of sins. The only One who shed His blood and rose from the grave! The only One who has the right to be called LORD! The only One who truely loves you! Prayer: Dear Heavenly Father, I know I am a sinner deserving your wrath. I have done things my way and not yours. 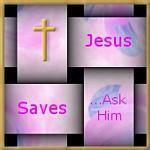 But, right now I call upon Jesus to forgive me of my sins and come into my heart and save me. Cleanse me from all unrighteousness and help me to live a life pleasing to the Lord. Thank you for loving me, help me to grow in your love. For I ask this in Jesus' name, Amen.